One look at Happy Kathy on Etsy might just have you taking a stroll down memory lane. 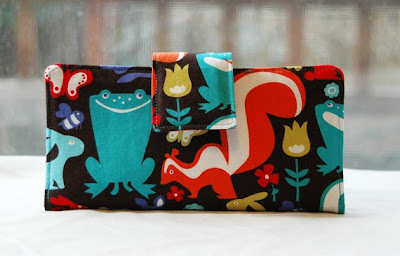 Retro fabrics, Pac Man themed passport covers, adorable bicycle wallets and as if those things weren't enough to send me straight back to my carefree days of the 1980's, all of these designs are created by Sarah from Astoria, Oregon, the setting for The Goonies! Not only has Sarah captured my youth in her designs, she also has modern and floral designs to please all tastes. Wallets, totes, handbags and more can be found at Happy Kathy. Named after her late mother Kathy, Sarah enjoyed seeing her smile and wanted to make that memory live on in her designs. I am sure after you see her shop you will agree with me that smiles are contagious at Happy Kathy! I couldn't resist featuring the ghosties, but Sarah is open to custom items as well. If looking for something in a different fabric feel free to send her a convo. This fits U.S. passports. Dimensions are listed on Happy Kathy. 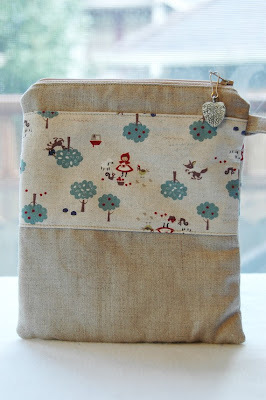 This pouch would be perfect for travel and the Little Red Riding Hood print could not be cuter! Featuring a zipper pull items placed inside will neatly stay in place. Green, pink and aqua...the colors of spring are bound to bring happiness to all. With a bird design on front and an owl hanging out on the back, this bag is perfect to tote magazines, your iPad, all the essentials! 1. Check out Happy Kathy. Come back here and tell us your favorite item(s). 3. Follow Joy De Vivre on facebook for a third entry. Entries will be accepted from now until next Tuesday March 22 at noon. Check back that night to see if you are the lucky winner! I love the handmade wallet snails and turtles. Aww I'm loving the bright and cheery tote bag you posted and the handwritten wallet. Perfect for this writer! I love my pink rose on blue wallet and my Paris map passport cover! I love my pink rose/blue background wallet and my vintage Paris map passport cover! My favorite is the wallet with japanese dogs design. So cute. I'm having the hardest time deciding my favorite between the light blue with floral fan design and the Japanese dog wallet. I love them both! Wow so many beautiful fabric prints on the wallets! 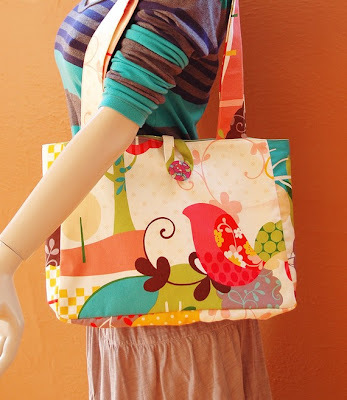 My favorite item is the Hand Enbroidered Owl on Linen tote bag. My favorites are the hummingbird wallet and the large weekender bag-- which also has the hummingbird in the patchwork! I enjoyed checking out the shop. I also follow this blog. but it wasn't easy to choose!! oh, and I'm already a follower.. I love this blog! I love it all! Sarah is awesome and "sew" talented! I adore the owl bag and wallets. I love owls and Sarah has picked the cutest owl fabrics to design with. I love the owl bag and wallets. Sarah has chosen the cutest owl fabrics to create with. I love my dragon pattern laptop case. It's perfect! I love my dragon pattern laptop bag. You can't find a bag with this pattern at any retail outlet! They are all awesome! I have used my wallet for over a year and it is still like brand new! 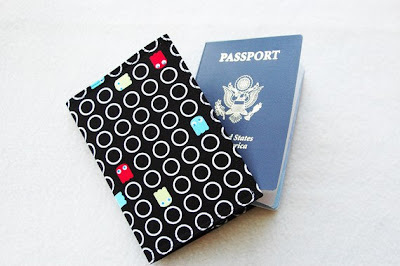 I love the Paris map passport cover!! I LOVE THE POUCH YOU CAN HOLD MAKE UP IN!!!!!!!!!!!!!!! I HAVE A WALLET FROM HAPPY KATH AND I LOOOOOOOOVVVVVEEEEEEEEEE IT! I love love love my little dog wallet from Happy Kathy. Amazing quality and such beautiful and practical designs!